Squamata is the largest of all the orders in the scientific classification. The order squamata has over 6,000 living species composed of suborders Lacertilia (Lizards), and the Serpentes (Snakes). Snakes and lizards are located all around the world, except for Antarctica and a few remote islands. Reptiles are cold blooded. Most reptiles have a closed chamber heart containing one ventricle. All reptiles have lungs for some aquatic turtles. Most reptiles have to hold their breath while swallowing. They all contain 12 pairs of cranial nerves. All lizards, snakes, and Worm Lizards have scales that cover their whole body. In snakes they are arranged in circular rings. Their dry skin protects the internal tissues from drying out. Snakes and lizards have a transparent cap that covers each eye in order to protect their eyes from dust and moisture. Most reptiles have these caps but they don’t have eyelids. All lizards, snakes, and reptiles have tongues but they have different uses. The lizards and snakes usually have a forked tongue. Lizards use it for catching bugs, but the snake uses its tongue to smell since they don't use normal air through their nostrils for smell. All of them have a Jacobson’s organ. Their diets are commonly known. Reptiles are carnivorous and snakes are omnivores. Snakes rely on their senses of smell and touch. They don't have a movable eyelid but to protect their eye the have a transparent cap for protecting the eye because they only have a limited eye movement. Snakes don’t have an external ear, middle ear, or tympanic membrane which disables their hearing so they are basically deaf but they can feel vibrations of sound waves through the ground. The disadvantage of this is they only hear low frequencies. They capture smells differently from other creatures. They have nostrils but since they aren't used to smell, they use their tongue in order to smell their prey. Snakes are covered in scales that protect them from abrasion and dehydration. There are smaller and thinner scales on the belly side in order to protect the tissues that contact the ground when they are moving. Many people presume their skin will be slimy possibly because it is shiny, but the actual truth is they have very dry skin. They only have two skin glands and a pair of scent glands to attract a mate. And snakes also, practice ecdysis (sheds skin). In the worm lizard category there are around 152 species. They look like a snake but are different from snakes. They have scales arranged in circular rings and have short tails, and also use their snout for digging. The worm lizards are usually legless while some species have front legs, but most live underground. All lizards and snakes are alike for mating. 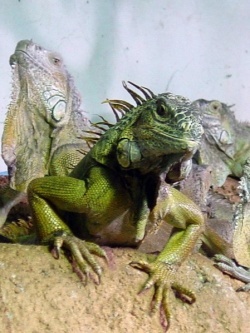 The lizards use their dewlaps to impress females and to intimidate any other rivals. The snake does the same thing but a little bit different. Female snakes attract the males by emitting scents. Lizards and snakes give birth to their offspring and reptiles lay eggs. Reptiles deposit their eggs in the nest they made and usually the snakes coil around their eggs to protect them from any predators. Their members usually have a territory. The males perform rituals to show possession of territory that they claim. Even snakes and lizards have wrestling matches. Worm lizards inhabit tropical areas: Africa, West Indies and South America, with one species in the United States, in Florida. Snakes are located everywhere like forests, lake shores, prairies and the desert. The only place you won’t see them is in Antarctica.